Keeping things fresh is a generally good idea. Whether it is your groceries, or your socks, ya’ just don’t want things to sit stagnant for too long without a reboot. In the case of a few HJC helmet models, that is exactly what is going down for the Fall of 2015. The HJC IS-17 Grapple helmet builds itself from the blueprint of one of the highest value helmets in the game. 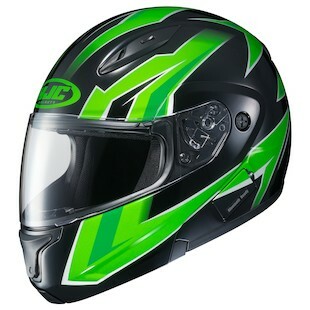 Coming in at a relatively modest price point, the IS-17 helmet is feature-rich in an advanced polycarb shell that has been constructed using the most recent CAD technology to give a great fitment and aerodynamic design. It has a one-touch integrated smoke-tinted sun-visor, is Pinlock ready (insert sold separately), and utilizes the RapidFire Shield replacement system for ease and efficiency. All of that inside a new, fast-paced, get-on-the-throttle Grapple graphic that offers a wide-variety of color options to suit your style. 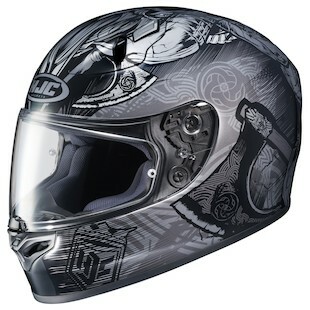 If you are of the mythological mindset, the new HJC FG-17 Valhalla helmet is the option for you. Based off of the legendary Norse hall at Asgard where the greatest of warriors were sent after falling in battle, the Valhalla graphic is as burly as the axe wielding aggressors for which it gets its name. Coming in under $200, the FG-17 is truly one of the best bang-for-your-buck options on the market. Some of its more high-end features include a lightweight fiberglass composite shell, Advanced Channeling Ventilation system, and a Pinlock prepared HJ-20M faceshield (Pinlock insert sold separately). 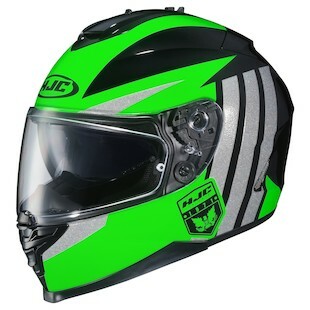 Rounding out some of the newest graphics from HJC, the new HJC CL-Max 2 Ridge is a modular helmet with an extra bit of lively attitude. Generally speaking, if you want a modular helmet you are going to get something a little bland in the graphical department. While they are great for comfort and long hours in the saddle, for some reason they tend to not be incredibly visually vibrant. However, the CL-Max 2 is looking to change all of that with the Ridge graphic which brings high-energy contrast and highly saturated colors to the table as a way to offer a few more options. HJC is known as one of the best entry-level / bang-for-your-buck manufacturers on the market, and with their new line of graphics for the Fall of 2015, they have added an equal amount of style to their arsenal as well.